The first day on the job as an attorney, Wanda Cooper called her Bayside High government teacher and made a plan to give back. From that moment, she has been inspiring young people to follow their dreams by speaking in areas schools and mentoring interns. “We let them walk in our shoes to see if they enjoy law work,” she says. A Virginia Beach native, Cooper began her education at a four-year university, but it was not a good fit. She returned to Hampton Roads and pursued a general studies degree at Tidewater Community College. “My parents never attended college, so my sister and I found out the hard way that education is costly and takes real work,” she explains. While at TCC, Cooper worked the switchboard at Virginia Beach General Hospital, which allowed flexibility for classes and to care for her elderly grandmother. “Coming home turned out to be such a blessing,” she says. Returning home also served as a launching pad for her own firm. As she prepared for a career in law, earning degrees at Old Dominion and Regent universities, Cooper realized how important family was to her, and incorporated that into her life plan. 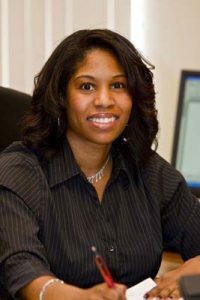 Progressing from corporate law to owning Cooper & Bullock with twin sister Tanya Bullock, also an attorney, she stayed true to that plan. “We work hard, but have flexibility and can cover for each other,” she adds. The firm now has seven employees, including two additional attorneys. “Opening the firm has been a miracle of sorts, because the recession has not impacted our caseload,” Cooper says. Cooper earned the Virginia Family Law Book Award in 2002 and the Urban League Silver Star award in 2006. She recently served as a panel member for a TCC event, Celebration of Sisterhood, which focused on strengthening African American families.